What was the motivation that caused the business to conduct an extensive web search, to go through the detailed and time consulting interview process, to ultimately find professional help with the development of their new monthly budgeting and forecasting processes, leveraging Microsoft Excel, Access, and Power BI. The motivation was simple, to overcome the time and costs needed to run the monthly budget and forecast update process. ♦ The cost in terms of time and money to run the monthly budgeting & forecasting process became far too great, too inefficient, with too many delays and far too many errors. They came to the point where they had to act, where they needed to build a new system. ♦ As in many of our clients’ situations, they do not reach out for help until the pain of their current situation far exceeds the cost of hiring a Microsoft Excel and Access budget developer. Why do I say that? Because organizations put off the financial cost and operational effort of new systems for as long as they can, and usually with good reason. Once they can justify the cost, once they can determine an acceptable ROI, they then hire a professional Microsoft solutions vendor to develop the budgeting system for their organization. 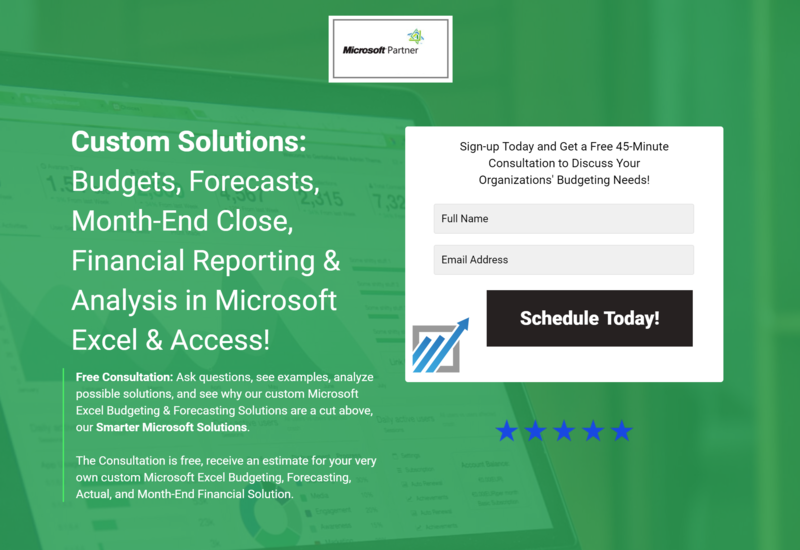 ♦ This client they had an urgent need; they needed to gain control of their budgeting, forecasting and month-end reporting processes, they needed a new 100% custom Microsoft Excel, Access and Power BI budget solutions. Why was their situation so bad? Because their monthly budgeting, forecasting, and reporting process was labor intensive, it was a manual process. It took the staff almost a week to update the files each month. This was time consuming and expensive, and error prone. The system that they hired us to build would do all of their budgeting, forecasting, month-end close, financial reporting and analysis. All of this in a single Microsoft Excel and Access based solution, a “Smarter Microsoft Solution“. Our Smarter Microsoft Solutions allow us to simplify the entire update process, and it allows us to greatly simplify the budget and forecast process. Point, Click, file runs, file ends, work is complete. This is just one example of the thousands of financial applications our staff have built in Microsoft Excel, Access, Office and Power BI over the past three or more decades of our careers. Initially the client was just looking to see if they could repair their current solution. Their solution took what they said was far too much time to run. They were looking for a way to have their staff do the work in less time than it was currently taking. Technically they had no idea how to do that, or even what that would look like, they just knew they wanted the work to take less time to perform. ♦ They did not know the technical details of what programming work would need to be done to speed up the solution, to reduce the labor associated with their budget and forecasting process. They just knew that they needed help. We knew the technical details. ♦ They had one solution for budgeting, one for forecasting, several for accounting’s month-end, several for financial reporting and analysis with another dozen or so mixed in. This was the primary cause of their problem. ♦ This was their motivation. The patchwork of files was built over 15 years, by a variety of different people, some skilled, some not. It was basically a poorly done solution. ♦ We stepped in to remedy the situation with a completely new, fully integrated and automated financial Microsoft solution; a single application. Technically speaking, they needed a fully Integrated & Automated financial solution using the Suite of Microsoft Office applications (Microsoft Excel, Access, Power BI) in addition to SQL Server. ♦ Their custom financial solution would be used for budgeting, forecasting, month-end close, financial analysis and reporting. ♦ Their solution would be built in the AS400, Microsoft SQL Server, Access, and Excel. ♦ Their solution would be built with a powerful and yet easy to use graphical user interface, in both Excel and Access. ♦ The solution would be built to be run with just a few clicks of the mouse. The user was removed from the equation. This is a true point-and-click system. ♦ The solution could be performed by just about anyone in the department, following a simple set of instructions. 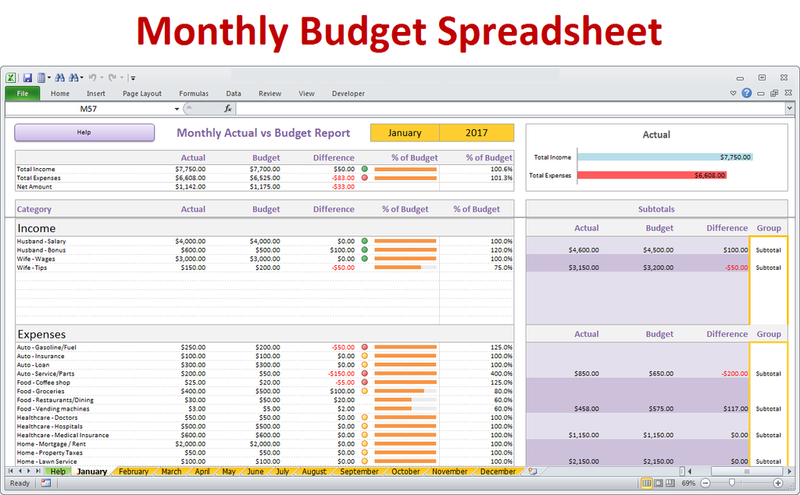 ♦ The custom Microsoft Excel and Access budgeting and forecasting solution would run in a matter of minutes or even seconds, not in hours or days. ♦ The client saved about a week’s worth of time each month. This freed the client to focus those energies and monies to work on other important automation projects. Our expert Microsoft Excel, Access & Power BI Programming, Consulting & Training Services are not just for business and not just for budgets and forecasts, there is a lot more to our Microsoft Solutions company than that. Our Microsoft programming services cover just about anything you can possibly do in Microsoft Office (Excel, Access, Word, Outlook, etc. ), or Microsoft SQL Server, cloud based Azure or Power BI. From advanced corporate financials to a simple phone list, Excel does it all. We do it all. But with that said, there are some things we do for our clients more often than others, one of the most common Microsoft Excel and Access programming solutions we develop for our customers would be a 100% customized budgeting and forecasting solutions in Microsoft Excel, Access and Power BI. These are usually relatively large solutions with a complex design, with many details, and it works like a charm. If your organization is a business (Microsoft, AT&T, Amazon, mom & pop shop), a government entity (DMV, SSD, US Navy, US Army), an educational institution (Harvard, Thunderbird, UCI, UCSD, OCC) or a non-profit (OCTD, YMCA, Queen Mary), it is likely that your organization has an annual budget and monthly forecasting process. It is one of the most common uses of MS Excel and Access across organizational types. It is a complete system usually with many files and a lot of VBA/Macros. It is also one of those Excel or Access solutions that you can do either very badly, really well, or somewhere in between. The firm you hire determines which of those three results you will ultimately end up with. Typically, as with most things, the lower the cost the lower the quality. There is an equilibrium, an optimal solution, you just need to find it. It starts with a conversation. We offer free consultations and free estimates. And a free consultation with a free estimate makes it easier for you to to find the company you want to work with. You would be surprised at just how many Microsoft Excel and Access budgets are done poorly. Advanced automation and integration are not a part of the poorly done systems. This client’s system was an extensive manual update process. The monthly commitment to altering and updating the budgeting, forecasting an financial reporting Excel and Access files for the new period was past excessive, it was absurd. A budget poorly done: They would manually change hundreds of formulas, insert columns, insert rows, insert new worksheets, manually copy and paste data from one worksheet to another, update links, and hand enter data. This is how files worked 20-years ago. Today’s best, or should we say “Smarter Microsoft Solutions” are point and click GUI (graphical user interface) solutions these days, and for a very good reason, big financial savings to the client. Files today should be centered around a custom tailored graphical user interface such as a Microsoft Excel UserForm or MS Access Form. They leverage the simplicity and power of a point-and-click system. “Push Button Simplicity” requires little effort or knowledge on the part of the person that uses the Microsoft Excel or Access files with the point and click system. That is the whole purpose of the GUI, enhanced user experience via simplicity. You use advanced worksheet design combined with expertly written VBA/Macros to develop the optimal graphical user interface and user experience. You care enough about the user to account for it in design. What types of manual efforts are possibly required to manually update a poorly designed Microsoft Excel or Access budget and forecast solution? Examples of what the user is doing, which they should not be doing, each taking time and effort, and thus money. Manually copy and paste data from one Excel workbook to another Excel spreadsheet. Manually copy and paste data from one Excel tab to another tab in the same workbook. Manually change formulas in Excel and then copy and paste the formulas to where they are needed. Excessive use of links between multiple Excel workbooks. Manually opening Microsoft Access, copying data from a table or query, then manually pasting the data into Microsoft Excel. Not leveraging the use of dynamic named ranges for data tables where the number of records changes, instead in a poorly designed system the user must be manually change the named data ranges range. The user must visually/manually validate and revise what cells are in the specified data range. Is any data outside of the data range? If so, alter the cells within the named range. Not dynamic as it should be, always used dynamic named ranges. Storing historical data in one or more Excel files versus putting that detailed transnational data in a back-end Access database to house and to properly manipulate the data. Hard coding values within formulas. Any manual change you must make to a Microsoft Excel or Access solution each time you run an update can usually be eliminated via integration and automation. Your file should update itself. Fully Integrated and Automated Budgeting and Forecasting Solutions are our expertise. We have been building them since Excel was first released in 1985. 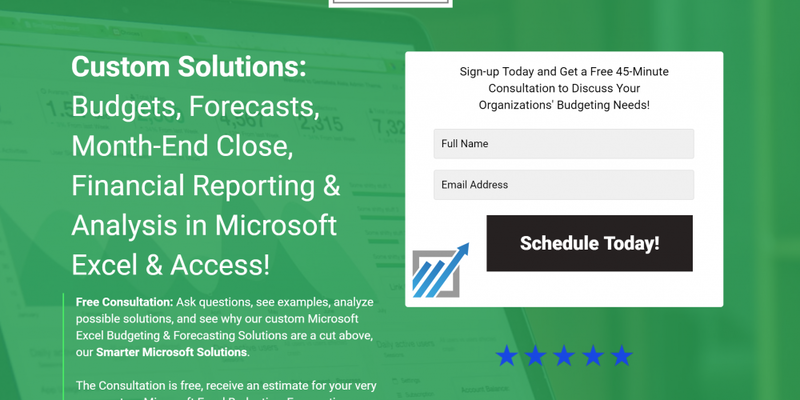 Contact us today to discuss our building a fully customized, integrated and automated budget and forecast solution for your organization in Microsoft Excel, Microsoft Access, and Power BI. How a properly integrated and automated Microsoft Excel and Access budget and forecast solution is built, with considerations similar to these in mind. Use VBA/Macros as much as possible to both maintain and to update the file each use. 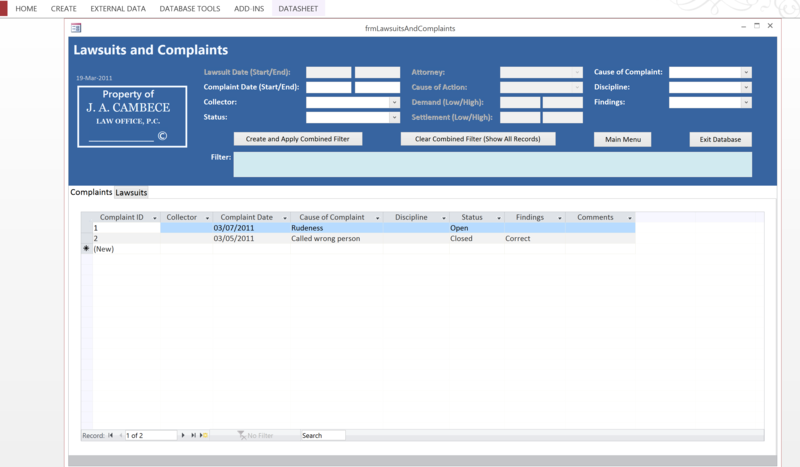 VBA integrates and automates Microsoft Applications. Use a well designed and highly intuitive graphical user interface (GUI) for the user interface. Use Microsoft Excel as the Data Visualization tool with dashboards, pivot tables, charts and graphs, etc. Use Microsoft Access as the data storage, data manipulation and calculation engine. Access was built to store and to manipulate “Big Data”, with efficiency. Excel was not; use the ‘right‘ tool for the task. 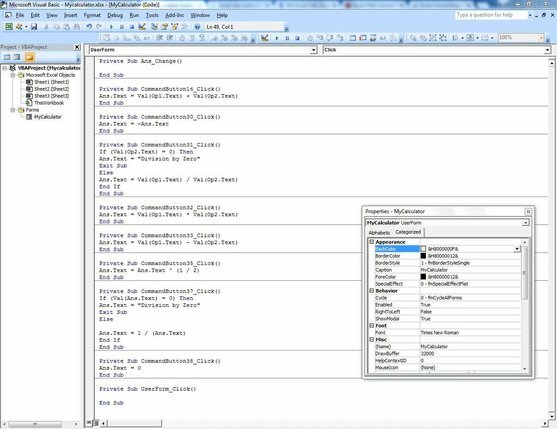 Create an Excel front-end with an Access back-end for “Big Data” projects. Excel and Access perform better together than they do apart. They were designed to be fully integrated. Much like man and wife, the sum is greater than the parts,; they enhance each other. 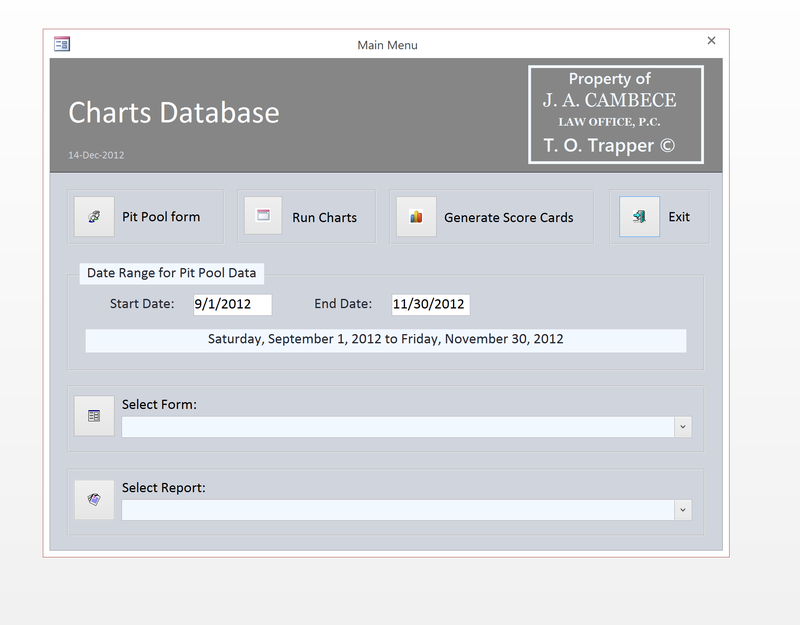 House the detailed and historical data in Microsoft Access databases. Use VBA in Excel to extract the filtered data from Access into Excel. Properly write formulas so that the formula itself does not need to be revised, a “Smarter Microsoft Solution“. Use Macros/VBA as much as possible to have the code update the file for you. Allow it to do all of the work. If you would like to discuss your budget and forecast needs with one of our data scientists and visualization experts, we can discuss how we can build one for you, give us a call at 877-392-3539.